Please join us for a fun filled MOFFA social at the Zilke farm in Milan Mi (south of Ann Arbor). 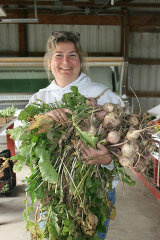 We will be hosted by Tom and Vicki Zilke for a tour of their farm, hoop house and gardens, and equpment shed. The Zilkes are in the process of transitioning to organic so would love to hear your thoughts too. Following the tour we will have a potluck and meet-and-greet so please bring a dish to share. See the flyer for details, or go ahead and reserve your space at moffa.net/farmtour.html.